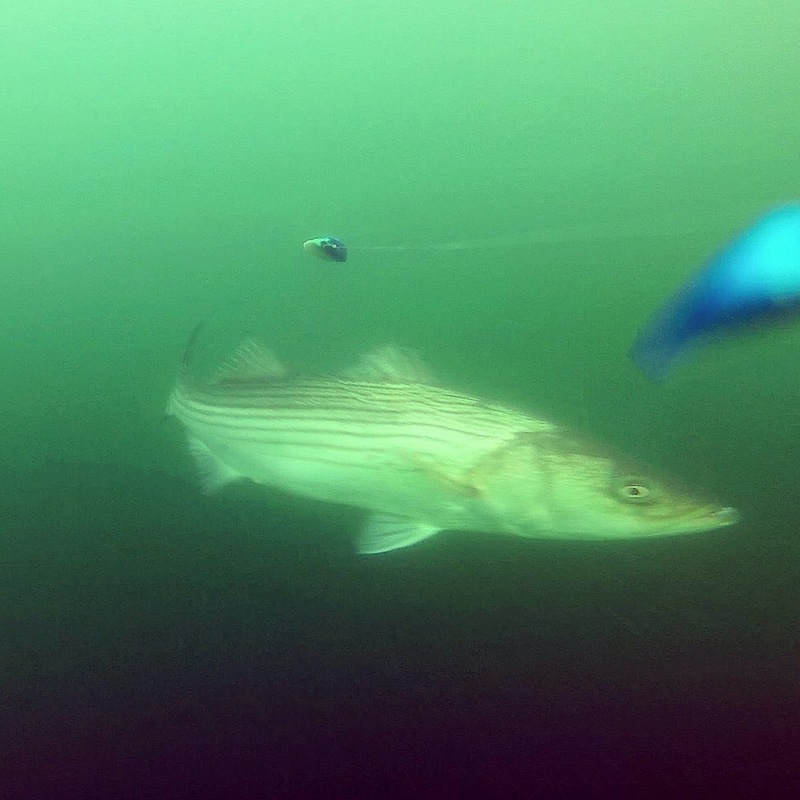 Here it is, the Striped Bass Jigging and Popping VIDEO from a single awesome trip. We have been lucky enough to have this action fairly consistently the past week and a half. I hope it keeps up for a couple more weeks! Be sure to stay tuned to the Tackle Talk VIDEO coming on Thanksgiving Day for this video and also a Striped Bass Trolling and tackle Talk Video coming in the next week or two. 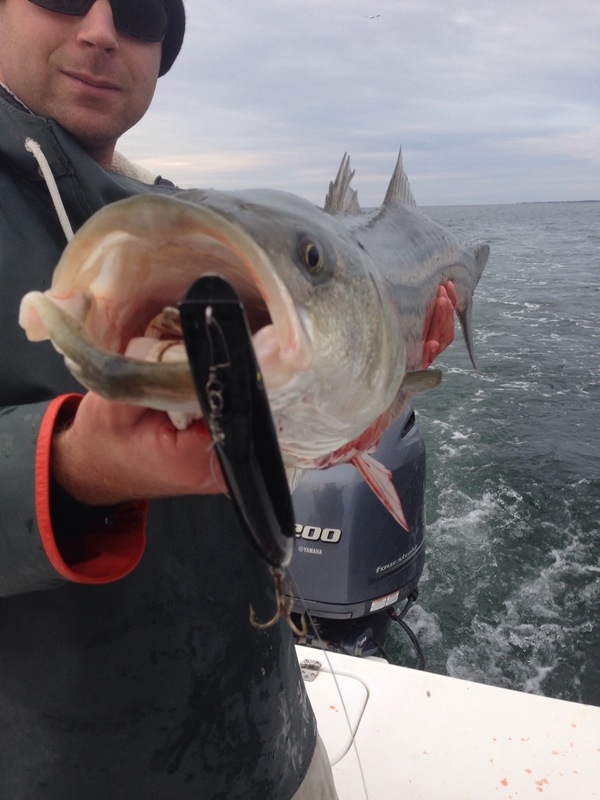 The bite continues… Today we fished out of GE Inlet on the Trade In again with Maureen, Anthony, and Joe. We got out front of Atlantic City with a 4-5 foot chop and stiff 20 knot SSW wind. It definitely kept the crowd down which was nice, but we were getting tossed a good bit. Anyway, we got setup along the 3 mile line where we found the fish on a small ridge yesterday and got trolling in the 50 degree water. 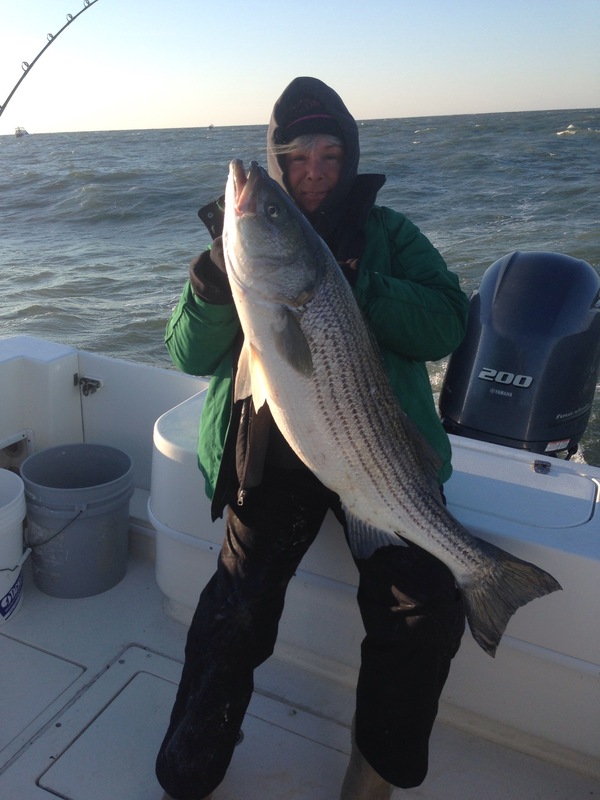 As the sun came up it didn’t take long to the birds to start working just offshore of us about 3.5-4 miles off the beach, taunting us (for those who don’t already know, it is illegal to target striped bass outside of the 3 mile line – federal waters). Anyway, we pounded it out and eventually the bait and fish came to us. 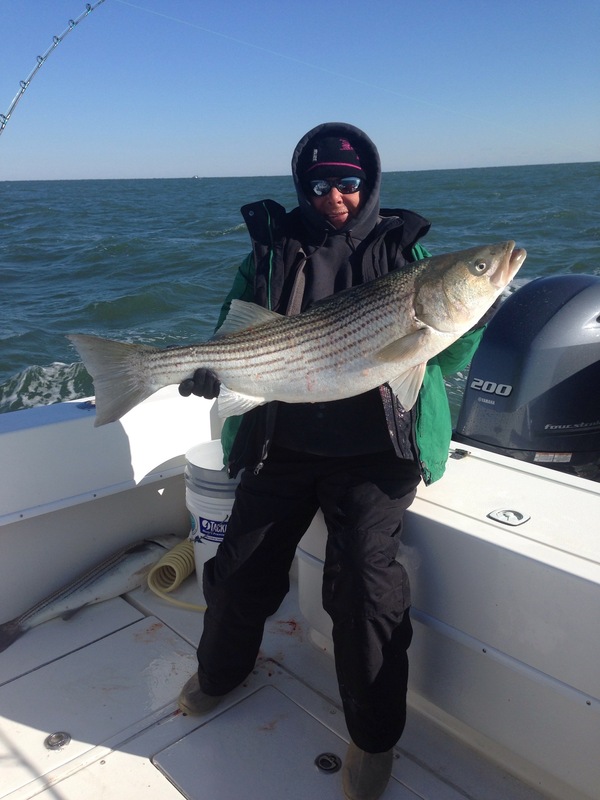 We picked at a few early then we continued to get a slow and steady pick of stripers weighing from 12-25 pounds all day. We had steady action which made the whole morning a lot of fun with a double header every now and then. As usual the chartreuse Mojo got hammered by stripers plenty today and we had a few more bites on the Lipped plugs today then the previous few days. I wonder if that is because this school of fish is smaller then the ones we have been catching all week. 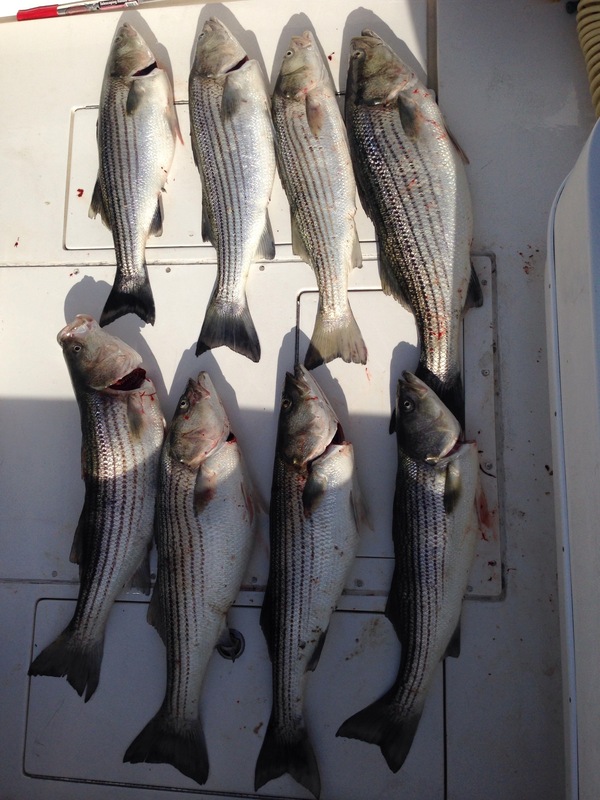 We ended up catching 13 stripers on the troll keeping our 4 man limit and releasing the rest. Another great day of fishing. P.S. 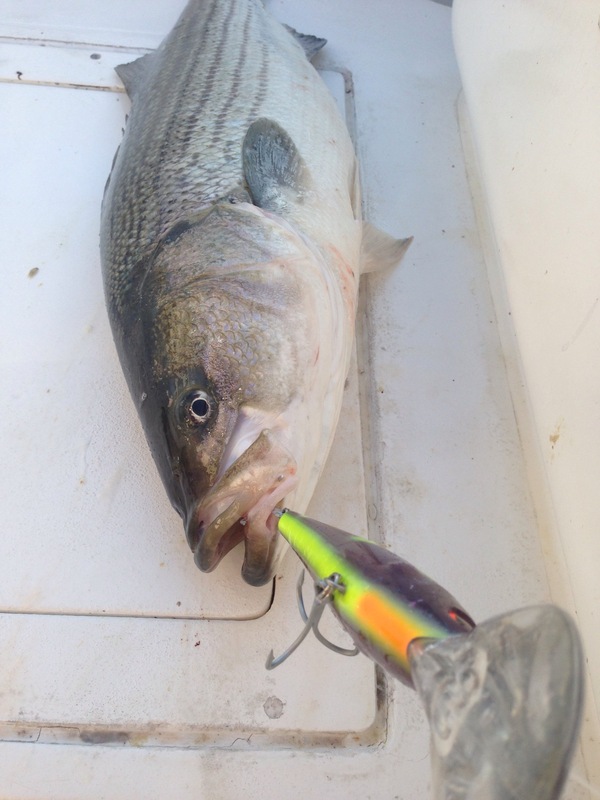 Although I will not be fishing, check back for my latest video I will be posting this week on Catching striped bass on Jigs and topwaters along with some sea bass action. A tackle talk will soon follow. SUBSCRIBE to my Youtube Channel by CLICKING HERE to keep up with the action or just keep up with my VIDEO PAGE of my website. We have been spoiled the past few days with phenomenal fishing we were due to be kept in check. Today we ran back out front looking for a troll/jig bite again and the winds were forecasted to be 20-30 out of the West which we can handle inside the 3 mile line. BUT the wind was SW which came straight up the beach and made for 4-6 foot choppy sea condition. Luckily it was warmer today then yesterday with temps in the mid forties and sunny. As we broke the inlet I saw 3 boats turn around and at that moment I slightly questioned my sanity, but away we went! We ran down the beach and got on the troll by 7:30am. 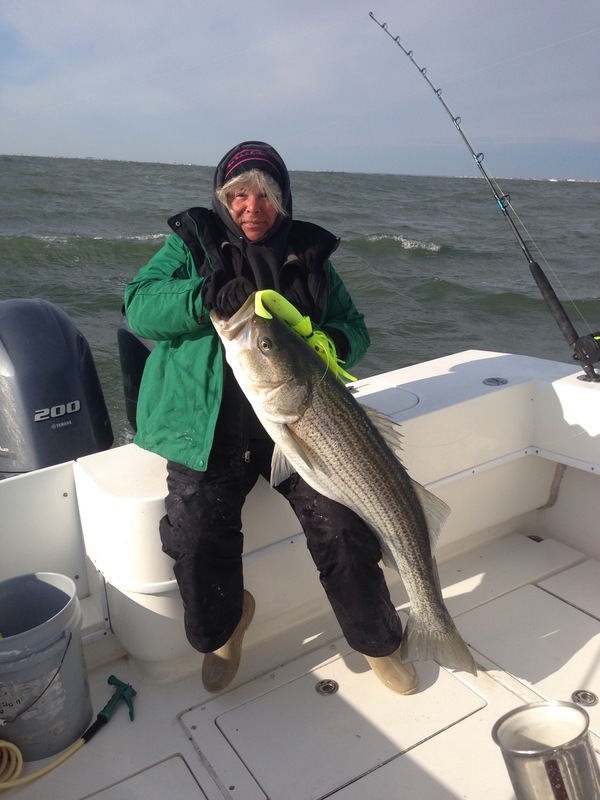 After an hour of trolling the purple lipped diving plug goes off and Maureen is on her first fish of the day. 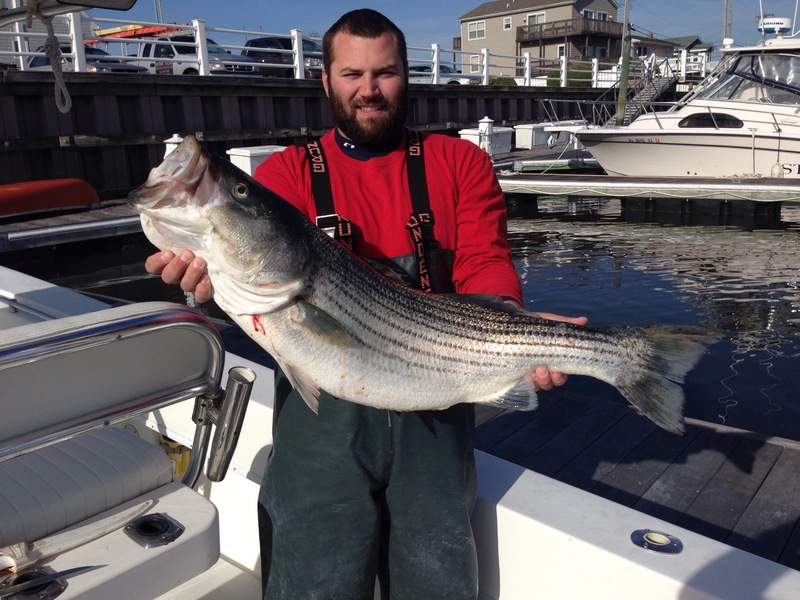 We land the nice 22# striper and get back on the troll. The water clarity was absolutely terrible today with visibility less then a foot, which isn’t good for trolling. 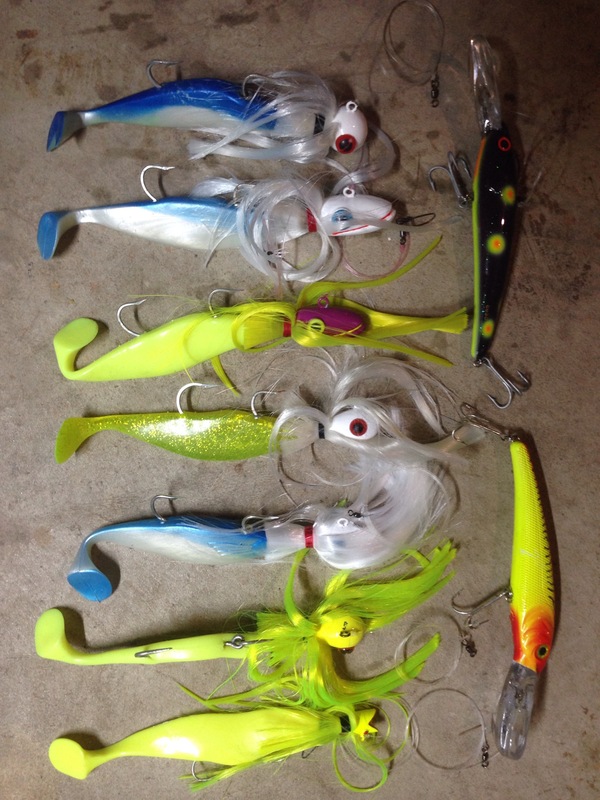 We kept at it and managed to pick up a nice 30# fish on the hot lure from yesterday, a chartreuse Mojo. It put up an awesome fight and made Mo work for the catch. It was tough for everyone south of TI Inlet today, but the bite was great around GE to Brigantine today with a wad of fish mauling bunker up there. Hopefully we get that school over the next few days down our way. 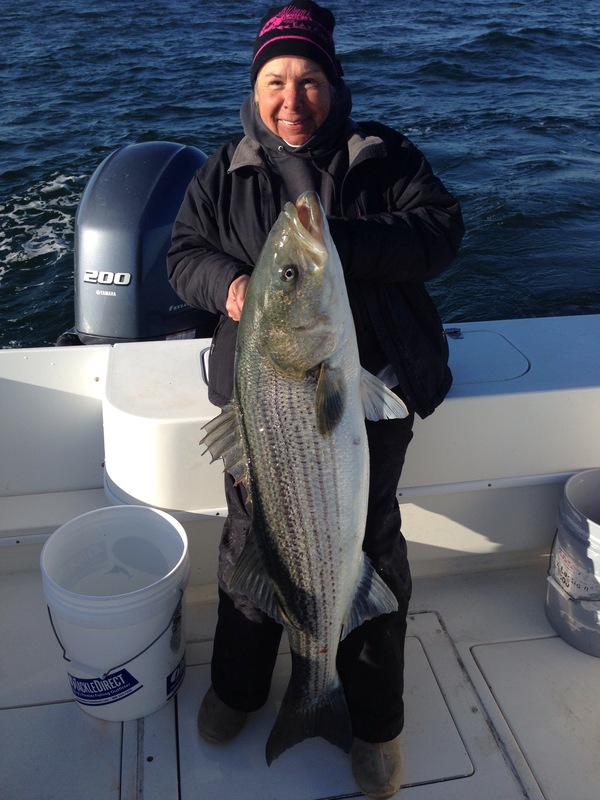 We have been lucky enough to be on an amazing striped bass blitz this week. The bite has mainly been during the am hours along the 3 mile EEZ line. The bite has been in different areas everyday but once you locate the schools with your sounder it has been game on. Today we had 50.5 degree water temps and got up on the troll late due to freezing temps and hopes for a little drop in the wind from 30 to 20 out of the west and we got it. Luckily I had a few friends who were on the fish already so we sprinted there and got on the troll. We had fairly consistent action the end of the morning hours picking up 9 keeper bass (and releasing most) up to 32 pounds. Most fish were on the chartreuse Mojos but we did catch a few on Stretch 30 plugs. No record today, but back at it again tomorrow. The west wind definitely ruined the water clarity, but luckily it didn’t effect the fishing. Hopefully the 20-30 west wind will be a little forgiving tomorrow. The fishing the past two days has been nothing short of a dream. 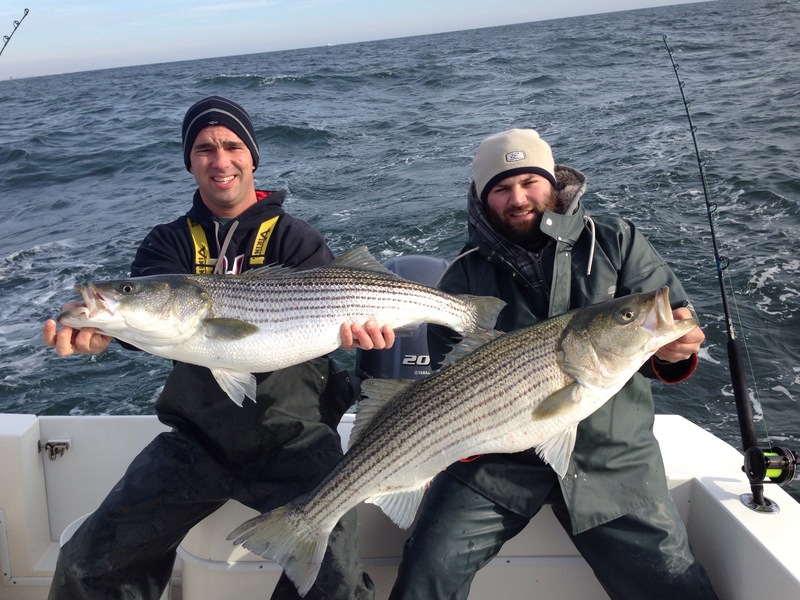 Yesterday we ran out and saw striped bass rolling on the surface, game on. They were thick and feeding heavy on bunker all throughout the water column. The water was 53 degrees and clean so you could see them take the poppers on top so easily and the bucktails next to the boat. The bite was epic and we caught our limit and then some of 20-35 pound fish. 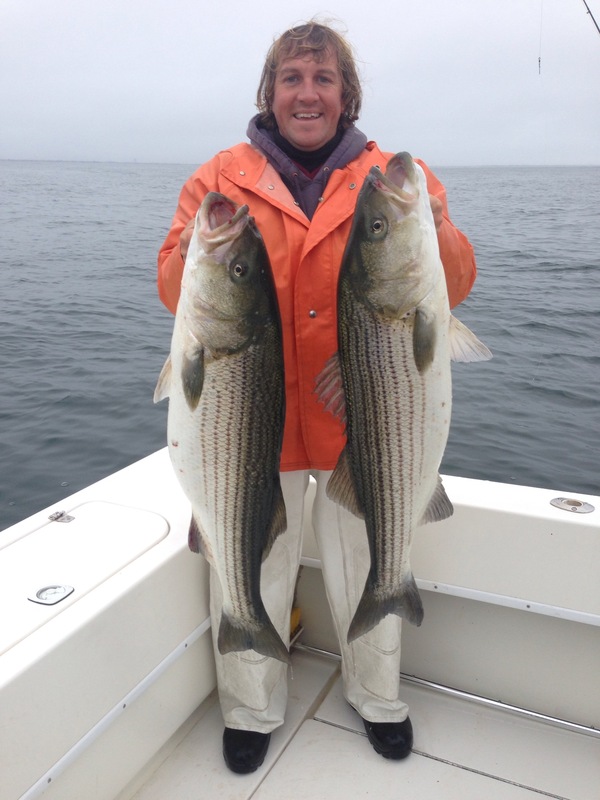 We ran inside and dropped off the Stripers so we could be legal to run beyond the 3 mile line for sea bass. 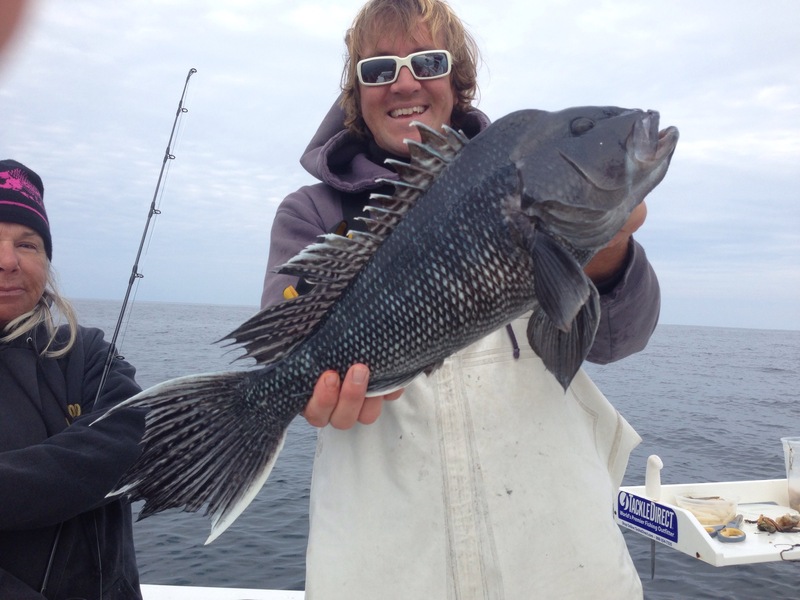 We had nonstop action on sea bass and tog all afternoon but most of the fish were small, but we did manage to get plenty of keepers and a few really nice sea bass. Today we had a small weather window so I slipped out with a few friends on the trade in again. There was tons of bait again and scattered birds diving off of the Wildwood Ferris wheel, but no stripers. We kept hunting looking for something better and finally around 9:30 we got on the fish. It turned into a repeat of yesterday with great action on bucktails and a few on topwaters with fish ranging from 18-30 pounds.